Step 1: present your 2018/2019 Ski Pass or Lift Ticket** at our Denver or Frisco locations when booking your guided trip. Step 3: go fishing and make some memories! 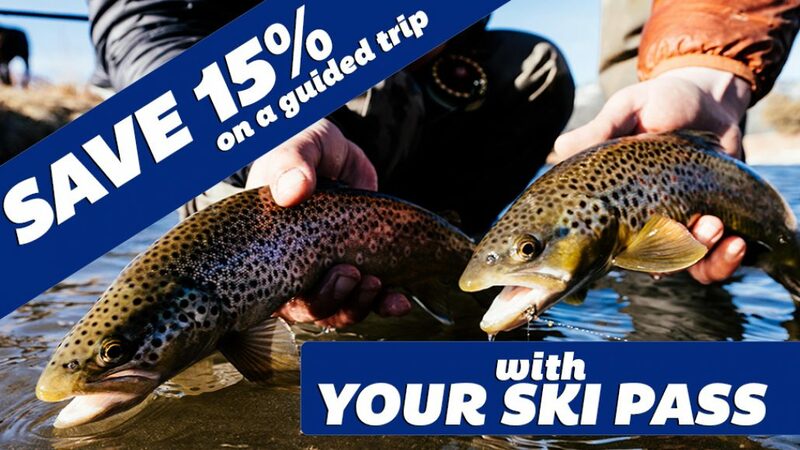 So whether you're looking to take a break from the slopes, or maybe maximize that last day of your vacation, this is a great opportunity to get out on the water and experience Winter Fly Fishing in Colorado. Keep in mind that this offer is valid at both our Denver and Frisco locations, so give us a call today to book your trip! Merry Christmas and Happy Holidays from everyone at Trouts Fly Fishing. *ski pass or lift ticket must be for the 2018/2019 ski season. Limit one redemption per customer and per trip. Valid for Colorado passes and lift tickets only. Gift Cards purchased at discount are not redeemable for this promotion. This promotion cannot be applied to previously booked trips.